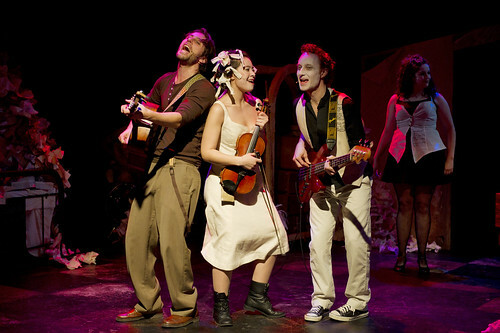 Chelsea Hotel is inventive and theatrical – and probably more fun than a Leonard Cohen concert! I saw Chelsea Hotel on Friday Night – the first performance… a world premiere – preview version… and LOVED IT. I have had Leonard Cohen ear-worms in my head all weekend, as I listened to my Cohen cd's trying to figure out the titles of the songs that were included in the production. There have been many musicals made of songs by specific songwriters. Mama Mia by ABBA… Jersey Boys is based on the music of The Four Seasons… Uptown Girl is the music of Billy Joel. And way before that, musicals were made of George Gershwin and Cole Porter songs. All of these have a story arcs, and dialogue to develop the plot lines. But there is no invented dialogue in Chelsea Hotel, nothing but the songs and poetry of Leonard Cohen. Director Tracey Power has conceived and created a theatrical presentation that moves seamlessly from song to song with interspersed words of poetry. The drama is in the storytelling of the songs. The dynamic tension is in the body language and the faces of the performers. The story is in the words of each song, as they speak of love, break ups, regret, hate, and reconciliation. And somehow it all works. The songs are strangely familiar, as they take their turns like old shirts from a long forgotten box of clothes. They are comfortable, and in a variety of musical styles and arrangements. Some songs are old like Suzanne or Lover Lover Lover. Many are from Cohen's middle period of the 80's and 90's such as I'm Your Man, Tower of Song, First We Take Manhattan and Hallelujah. The production is sooooo playful. There is a carnival cabaret atmosphere, with the performers all wearing whitened faces and exagerated costumes. Benjamin Elliot's character is called The Magician. Musical Director Steve Charles is performing as The Side Man. The arrangements vary from solo instruments to string trio, acoustic folk stylings, to full-on rock and roll. 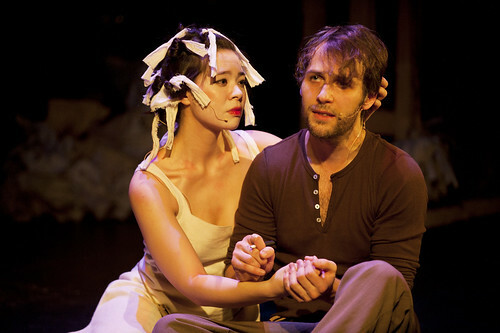 crumpled paper after appearing first as musical supporting cast on violin, and her character The Lover, takes on increasingly important dynamics. Friday night was the first audience performance prior to Wednesday's Opening Night on Feb 8th. I thought the production flowed well. There was a standing ovation for the performers. 1) don't sit in row A on the floor – there is a row AA in front of you that obscures your view. of the stage and performers – that are hidden by a set design. This entry was posted in Accordions, Literary Events, Main Page, Music, Recent Reviews, Theatre, Upcoming Events, Visual Art and related events on February 9, 2012 by Todd. be returning to co-host the Gung Haggis Fat Choy dinner. stage. He is a very talented entertainer with a gift for the gab. He is comfortable with a large audience. And outrageous when he is old friends with his co-host and fellow stage performers. Tetsuro himself is very intercultural, very Gung Haggis. While he is of Japanese ancestry, he was born in London England, and raised in Quebec. His wife is Persian… He speaks Persian as well as English, French and Japanese… And his beautiful spirited children are Japanese-Persian-Canadians. I first got to know Tetsuro back in the early 2000's when he was a member of the sketch comedy group, The Hot Sauce Posse. Soon after he was the new radio host for CBC Radio's “The Round Up” replacing Bill Richardson. In February, Tetsuro was a speaker for TedX – the topic sounds soooo Gung Haggis. Chinese in Kilts? A walking Oxymoron? This past summer Tetsuro has been very busy. He hosted the Asian Comedy Night by Vancouver Asian Canadian Theatre in June. Magazine, Epoch Times, Vancouver Observer, etc. This entry was posted in 2012 Gung Haggis Fat Choy Dinner, Asian Canadian Cultural Events, Cultural Fusion, Gung Haggis Fat Choy dinner, Main Page, Multicultural events, Theatre, Upcoming Events, Visual Art and related events on December 30, 2011 by Todd. May Wong: In Her Own Words. Chinese American female actress in Hollywood. excellent drinks, and fantastic atmosphere. enjoyed the jokes, laughing often at the witty dialogue and clever script. DIRECTOR / WRITER: Elaine H.
challenge common notions of Asian women. richly detailed picture of a woman and her times. This entry was posted in Main Page, Multicultural events, Visual Art and related events on November 9, 2011 by Todd. like this year is the biggest one yet. Clement Woo, and board director Iven Tse. Chiba Stearns was also on hand. This entry was posted in Asian Canadian Cultural Events, Main Page, Recent Reviews, Visual Art and related events on November 7, 2011 by Todd. The Vancouver Asian Film Festival is now 15 years old. I started attending VAFF around 2000, when festival founder Barb Lee came to a dinner event for Asian Canadian Writers' Workshop, trying to promote VAFF. Many years later, VAFF is now one of the biggest and best events in the Asian Canadian cultural scene. It has grown from a one day event to a four day event. Back in 2000, there were few movies that were made or set in North America, and made by North American Asians. A lot of films shown at early VAFF events still came from Asia, while some came from the US. In recent years, VAFF has really matured into its own. The Mighty Asiam Movie Making Marathon has helped to develop more local talent and films. VAFF events now regularly feature Canadian directors and film makers, as well as actors. 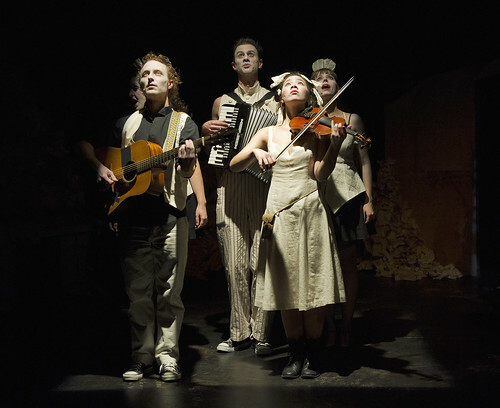 Here are some of the 2011 VAFF 15 events that have caught my eye… that I wish I could attend – if I wasn't already committed to performing my accordion in the Heart of the City Festival this weekend. This entry was posted in Asian Canadian Cultural Events, Chinese Canadian History, Main Page, Upcoming Events, Visual Art and related events on November 5, 2011 by Todd. Early media stories on Hapa Palooza – we got a buzz! – we got a buzz! Hapa-palooza hype builds, but will it deliver? This entry was posted in Asian Canadian Cultural Events, Canadian Identity, Canadian Identity & Heritage, Cultural Fusion, Hapa culture, Literary Events, Main Page, Multicultural events, Scottish, Gaelic, Irish Celtic events and stories, Upcoming Events, Visual Art and related events on September 8, 2011 by Todd. The sky turned blue with occasional clouds, with lots of sunshine for the Vancouver 125 Celebrations, marking the 125th birthday of the City of Vancouver. 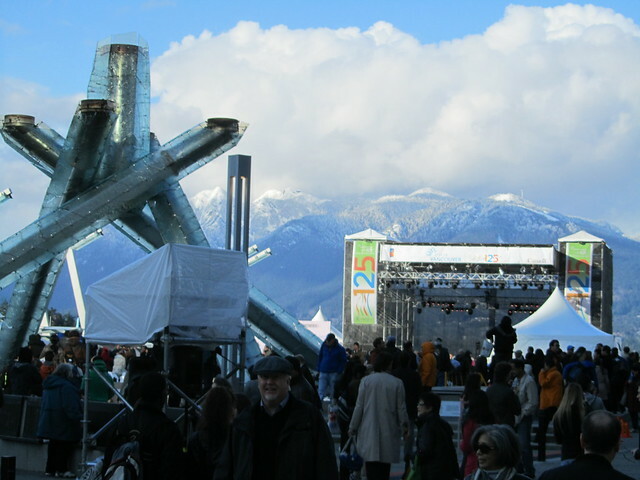 Fresh snow decorated the local mountains, yet the Jack Poole Plaza was a warmish 9 degrees in the sunshine. The concert stage opened at 4pm with Uzume Taiko, followed by Mmm-HoP, and Leela Gilday. The 6pm ceremonies featured a birthday singalong by the Vancouver Bach Choir, of which city councilor Heather Deal is a singer. Vancouver Mayor Gregor Robertson with Vancouver 125 Team city employees Kathy Bengston and Todd Wong. The Mayor was dressed for ball hockey and he played with some of the teams, then later posed for pictures with the youth teams. 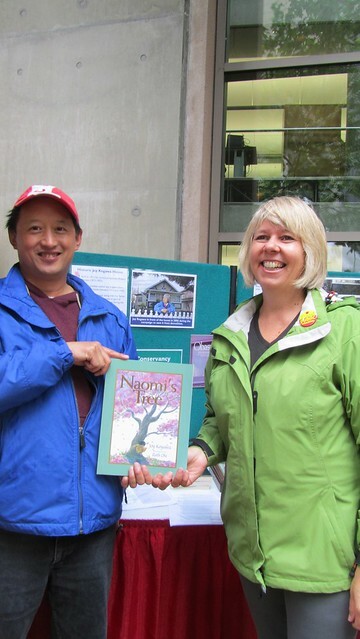 Wong works for the Vancouver Public Library and wore the Fraser Hunting Tartan kilt, because April 6th is also Tartan Day throughout Canada, and because the Fraser Hunting Tartan has the similar blues and greens of the Vancouver Tartan. 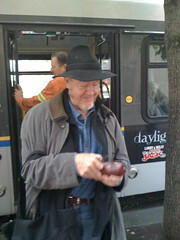 Bengston was part of the City of Vancouver Host team and was stationed at the Downtown Live City venue during the Olympics. 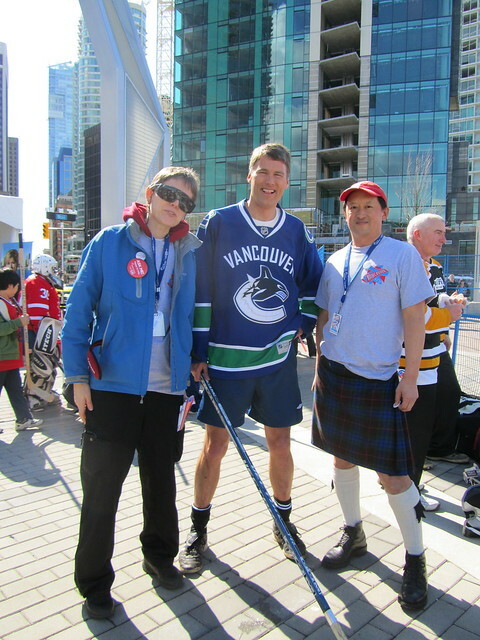 My role for the Vancouver 125 Team was to help out with the ball hockey games. During my breaks, I walked around the Jack Poole Plaza and saw the music performances that featured some of my friends. 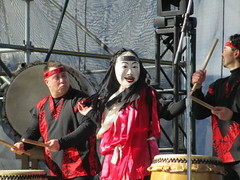 Bonnie Mah is part of Uzume Taiko. Ndidi Cascade was one of the performers of Mm-HoP: Hop Jump Jive. Uzume Taiko blends the traditonal and contemporaryarts into a great cultural fusion using Taiko drums, traditional Japanese masks…. and bagpipes! Here is the bagpiper for Uzume Taiko wearing Japanese styled outfit. 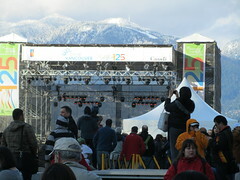 It was a picturesque day with fresh snow on the mountains, and all the people creating a happy crowd. 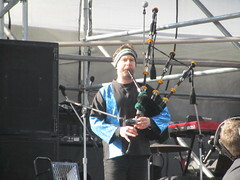 This entry was posted in Asian Canadian Cultural Events, Bagpipes, Cultural Fusion, Kilts - wearing kilts, Main Page, Multicultural events, politics and politicians, Scottish, Gaelic, Irish Celtic events and stories, Todd Wong, Vancouver Area Adventures, Vancouver Heritage and History, Visual Art and related events on April 7, 2011 by Todd. Vancouver Opera: La Clemenza di Tito – Leadership or culture bending subtlety? Expect an evening of subtlety and sublime beautiful music. No big action scenes or over the top drama of people taking 10 minutes to die. It's a salon-style opera with beautiful and exquisite Mozart music. Do pay attention to the costume changes, and the spiritual metaphor of the Greek-style chorus. Also keep your eyes open for gender bending roles, as castrato singers are now non-existent, but replaced by female sopranos.. The story is about the “clemency” or “mercy” of Emperor Tito. As he strives to be a leader for all of the empire, valuing forgiveness and belief in the goodness of others, he faces the ultimate challenge – the betrayal of a loyal friend, and a chosen consort. An All-Canadian cast give strong lead performances as Toronto's Krisztina Szabo as “Sesto”, carries out the wicked revenge plot of New Brunswick's Wendy Nielsen as Vitellia against Edmonton's John Tessier as Emperor Tito. The roles of Sesto and also Servilia (Campbell River's Kathleen Brett) were originally written for castrati males, but now played by female mezzo-soprano and soprano, made for some interesting gender bending romance. As in traditional Chinese opera, female roles were traditionally played by males, because “only men knew how women should act”, according to the line in the David Henry Hwang play and movie “M. Butterfly. Technically, the roles are male, but it's interesting to play with a female + female context. And of course we go to opera for the music! But in a town such as Vancouver with a large GLBT population, this is a good market for such a piece. Vitellia has her eye on the crown of the empress, and has been passed over by Tito several times, in favor of other women such as Servilia. She takes advantage of Sesto's “love” for her, and asks Sesto to murder Titus. 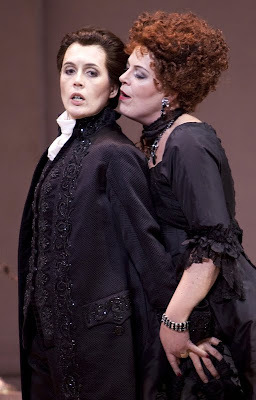 But before this can happen, Servilia admits to Tito that she is actually in love with Vitellia's brother Annio (Calgary's Norine Burgess – in the 2nd castrato role). This is all acted and sung out in lovely tension-filled arias, as the plot unravels up to the intermission. 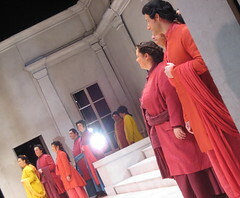 Picture of the Chorus costumes, while taking bows, from the Vancouver Opera flickr stream. The chorus is presented in the style of a editorializing Greek Chorus, that comments on the actions and thoughts of the lead characters as if they are the gods, that these Romans blame or pray to. Interestingly, they are dressed in toga-like robes of saffron, orange and reds that would seem to be more commonly found on an ashram in India. A gold dot also adorns the forehead of each chorus member. The background of this rarely performed Mozart opera is very interesting. Not as bombastic as Don Giovanni or The Magic Flute, or as full of musical flurries such as Cosi Fan Tutte, La Clemenza di Tito is a delight in its subtlety. Supposedly written in three weeks while Mozart was ill, and while he was still working on the Magic Flute. It was a rush job, for the coronation of Emperor Leopold II as the new king of Bohemia. other composers – but as I sat in the theatre, all I could hear was Mozart. From the opening bars of the overture, it reminded me of how much Mozart has meant to both my musical education and pleasure. It recalled the days of my youth when I played Mozart's Titus Overture in an accordion ensemble, and in my college days, when I performed the Sallieri soliloquy from the Peter Shaffer play “Amadeus.” And like so many of the audience, I became lost in the beauty of the music, as the orchestra dissolved to the simplicity of a solo piano forte performed by Conductor and musical director Jonathan Darlington, accentuated by solo cello, clarinet or basset horn. We were very pleased to see the soloists from the orchestra, Ari Barnes, Mary Backun and Caroline Gauthier brought up on stage for bows along with Chorus Director Leslie Dala. Last week CBC Radio One was discussing the opera audience as white-haired and caucasian (which I don't fit into – okay maybe the age demographic since I turned 50 last May). The Vancouver opera is very aware of trying to reach a more culturally diverse audience. While some of the bloggers commented that it was a very mixed ethnic crowd on opening night Saturday on Feb 5th, the audience that I saw on Tuesday Feb 8th, was very white haired and caucasian. But I did see a number of gay and lesbian couples. Cultural diversity can take many forms. If the opera does want a more ethnic mix in the audience, the best route to go is to feature more ethnic leads in key roles, not just in Madame Butterfly and Turandot, or Nixon in China – but in all productions. Afterall opera in Hong Kong, and Japan feature Asian singers in many roles. The costumes in La Clemenza di Tito were 18th Century, while the opera is set in Ancient Rome. In the first half, the principles are wearing black, in the second half they are wearing white. The chorus appears to be wearing South Asian style religious robes, all in the name of artistic merit – not historical accuracy. Female singers have replaced male in the original castrato roles. A few singers of colour in lead roles would not look out of place in this production. This entry was posted in Cultural Fusion, Main Page, Multicultural events, Music, Recent Reviews, Theatre, Visual Art and related events on February 10, 2011 by Todd.